Moritaza (守田座), a major Kabuki theater, in Shintomi-cho (新富町), Tokyo. The theater moved here in October 1872 (Meiji 5) from Saruwaka-machi in Asakusa (浅草猿若町). 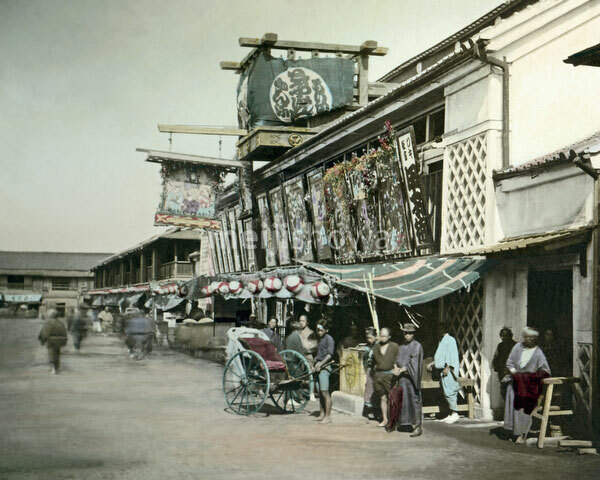 In 1875 (Meiji 8) it was renamed Shintomiza (後新富座), dating this image to between those two dates. The building burned down in 1876 (Meiji 9). This image has been attributed to both Felice Beato and Baron Raimund von Stillfried.